One of the booklets I have collected over the years is the 100 Year History of the United Methodist Church in Waldheim. The booklet was published in 1975 and contained a wealth of information about the church, how it started,the families involved in its growth, and its impact on the community. When we began to collect material for the story of the first century of the Boniface-Waldheim Church, we soon realized that local records would provide little information. As persons who had lived in those early days had long departed this life, it became necessary to search in a broader field for information. This was a slow, discouraging process, which consumed several years and involved much correspondence through which a bishop, several district superintendents, and a number of preachers were contacted, but no information obtained. Finally, through careful examination of two old newspaper files, there was a breakthrough. Slowly, other information came to light. We are grateful to Bishop Finas A. Crutchfield, Louisiana Area, United Methodist Church, for consenting to our use of material found in microfilmed records of the long discontinued New Orleans Christian Advocate; it was in this paper, nearly 100 years old, that we found our first clue, together with information on the organization of the German Mission Conference, and two letters by Dr. J. B. A. Ahrens which positively identified our church and the date of its dedication. We express our appreciation to Mrs. Vera B. Hardman, Manager, The St Tammany Fanner, for permission to use many news items concerning the Camp Grounds, the building of the Tabernacle, improvements to the church etc., which were found within its pages. To Mrs. John H. Warnick, Methodist Historical Librarian, Bridwell Library, Southern Methodist University, we will be forever indebted. Through her kindness we came into possession of very valuable information concerning the German Mission Conference and its preachers as well as pictures of the entire Conference of 1881, some of the members of which had served our church during their pathetically short lives. We are indebted to the Rev. J. A. Lindsey, Methodist Conference Historical Society, for a minutely detailed record of Mississippi Conference appointments for the years 1827 through 1894; to the Rev. J. B. Cain, Director, Methodist Historical Research, for his constructively critical comments concerning Auguste Gottschall's appointment; to Frank W. Ellis for so much valuable information concerning his father, the Rev. G. R. Ellis, as well as his friendly correspondence over several years; to J. P. Lozes, Jr., and Jay Lozes, our son-in-law and grandson, for their beautiful pictures of present day Waldheim Church and of our old books and records; to my daughter, who does not want to be named, for her patient and painstaking labor in fashioning the various buildings of the "Camp Ground as it was", and last, but certainly not least, to my beloved wife Johanna, who for hours at a time carefully examined microfilm records of newspapers, laboriously translated German newspaper items, and, during the period in which this history was being typed, corrected, retyped and again retyped, carried on alone all of the work of our household. If, in this acknowledgement, we have overlooked anyone who has helped us in any manner, or if, in spite of careful checking of our material, inaccuracies or omissions are noted, we offer our sincere apologies. There is no written record of the origin of a Methodist Church in the community now called Waldheim. While the date of dedication of the main church building and the forming of the first "Class" are established, it is necessary to look back to the German churches of New Orleans and to their ministers and leaders for some degree of information on this subject. The years 1840-1860 brought thousands of German immigrants to America. Many of these people either came directly, or later found their way, to New Orleans where, in the year 1853, 36,000, and in 1854, 40,006, Germans were received. Although the dreaded yellow fever took a terrible toll of lives, those who survived or escaped it comprised a large German community. Many of these were professional people, schooled in medicine, law, music, art; there were engineers, journalists, iron makers, textile manufacturers, piano and organ makers, printers, etc. These people had fled Germany mainly because of political oppression and, in some areas, the enforced state religion. There were Catholics, Lutherans, and Methodists among them, and they wanted freedom of religion. In course of time their churches were established, some of which still exist although German is no longer used in their services. According to the Texas Centennial Yearbook, the first German Mission of the Methodist Episcopal Church was established on Dryades Street, no date being given. Later, a lot was purchased on Dryades between Euterpe and Felicity, where, in 1855 Dryades Street Church was built. In the meantime other German language churches were being formed among people who were Methodists. The great majority of the German ministers were enthusiastic in their calling and overlooked no opportunity to spread the Word of God wherever they went. And spread it they did -in German. One of the places to which it was brought was St. Tammany! Without doubt the work of these German "missionaries" took root in this community many years before the building and dedication of our present church. "Presented to the Methodist German Church of Covington Settlement by the Ladies' Bible Society, Woodville, Mississippi, December 25,1861." While there are no records to indicate the number of members of this Ladies' Bible Society, the quality of their gift, more than one hundred years old and for many years given less then proper protection, indicates their love and without question their financial sacrifice. The lack of records of their society is regretable because, had there been records, they might have thrown light on a puzzling question -"Why were the Woodville ladies especially interested in this particular church?" Mississippi Conference records show pastoral appointments for German Mission for the years 1843-44-45-46 to the New Orleans District, 1860-61-62-63-64 to the Brookhaven District, and 1865-66-67 to the Natchez District. In these appointments we find what might possibly be a clue to the very first years of a German Methodist Church in our community, which was still within the bounds of the Mississippi Conference; New Orleans Methodism being in the Louisiana Conference. In December, 1859, at the Mississippi Conference, Auguste Gottschall was appointed to the German Mission in the Brookhaven District. This appointment was for the year 1860. He was reappointed to the German Mission in the same district through 1864 when the Mission was placed in the Natchez District. He was again reappointed to the German Mission in 1865-66-67 after which there is no further record of him or of the Mission. These appointments were made in November or December and were for the ensuing year. At this point the author must quote verbatim from a letter addressed to him under date of February 24, 1975, by the Rev. J. B. Cain, Director, Mississippi Historical Research, Washington, Miss. "As you have discovered, there are some complications in the study of this question. The fact that the Methodist churches in the Florida Parishes of Louisiana were in the Mississippi Conference until 1894 is one; then the events of the Civil War made reports difficult and in some cases impossible.
" 'N. 0.1. & G. N. Railway, German Mission-Auguste Gottschall. This meant 'New Orleans, Illinois, and Great Northern Railway,' which was the same as the present Illinois Central. He was continued on this charge, under the name of German Mission, until 1865. At the Annual Conference of 1860, this charge -it may have been more than one church- reported 19 members, which number increased in 1861 to 62, but in 1862 had declined to 30, and in 1865 no members at all were reported. Now my own feeling is that this mission, which began in 1860 and folded up a few years later, had no connection with the one at Waldheim which began some years later." While the location of this German Mission has not been established, three facts strongly indicate that it could have been on our present church grounds. First, the printed record of the, appointment of Auguste Gottschall is coupled in parentheses with John A. Vance who was assigned to Covington, at that time also in the Brookhaven District. This was in 1861. 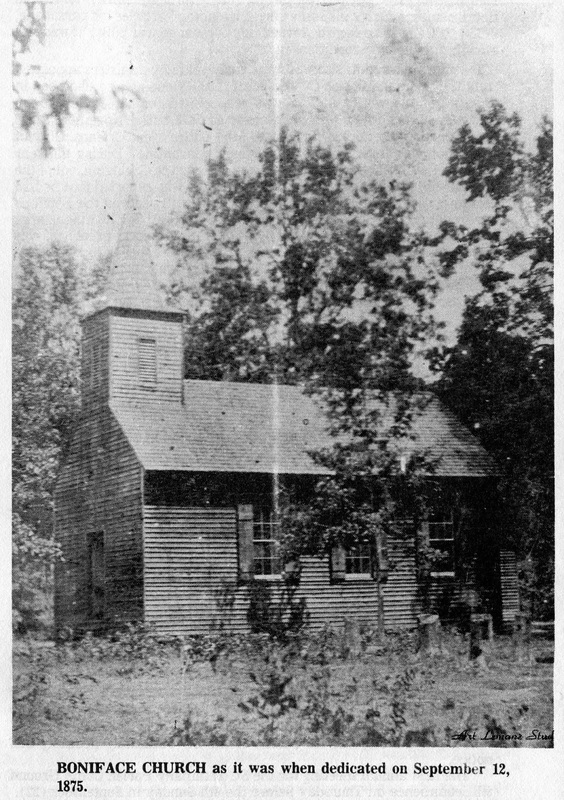 Second, members of the author's family, along with many of the earlier residents, attended school in a little log house on the present church grounds. This building was known and used as a church in the earliest days, services being conducted there in German by Friedrich Matthies, a local preacher, later ordained an elder in the Louisiana Conference of the Methodist Episcopal Church, South. Third, the German Bible inscribed by the Ladies of Woodville, Miss., in our possession. On the basis of these facts, it is reasonable to believe that there was a German Methodist Church and congregation located on our present church property as early as perhaps 1860. Of the years 1869 through 1874 there is no record, but it is highly probably that Mr. Matthies held services at that time in the old log church. The Conference appointments quoted have been obtained from very reliable sources: die Rev. J. A. Lindsey, President, Mississippi Conference Historical Society, Woodville, Miss., the Rev. J. B. Cain, Director of Research, Mississippi Conference Historical Commission, Washington, Miss., and through Xerox copies of records in the Methodist Historical Collection, Bridwell Library, Perkins School of Theology, Southern Methodist University, Dallas, Texas, the latter graciously furnished the author by Mrs. John H. Warnick, Methodist Historical Librarian. As previously stated, there is a gap in the records concerning the early German Mission. But the German ministers in New Orleans and in Texas were vigorously working to spread God's Word and, believing that a more effective ministry could be brought to the German people by German preachers, memorialized General Conference to set aside "so much of the work in the States of Texas and Louisiana as is under the supervision of the German ministers of our church," into a separate Conference. The General Conference, convened at Louisville, Ky., in 1874, approved this petition on May 9, stating, "we...unanimously recommend the formation of such a Conference at the earliest practical period, to be known as the German Mission Conference of the Methodist Episcopal Church, South." This obviously became the official name of the new Conference although legal documents later identified it as the German Mission Conference of East Texas and Louisiana, which, with the exception of the word "East", was the name requested by the petitioning ministers. The German preachers lost little time in moving forward. In the last week of December, 1874, they met at Houston, Texas, and under the leadership of Bishop J. C. Keener, organized the German Mission Conference with the Bishop as President and the Rev. J. B. A. Ahrens as Secretary. Three Districts were formed, New Orleans, New Braunfels, and Beaumont. At this point in this history it is very important to stress the fact that, although we have not yet been able to prove the existence of a church or congregation in our community, the appointments to the various charges in the New Orleans District of the new Conference include our present church as will be shown later. The work of the German Conference in Louisiana continued until May, 1886, when, because of the declining membership caused by deaths of the older German members and the unwillingness of younger Germans to attend German services, the ministers of the remaining three German congregations in New Orleans petitioned General Conference "asking for transfer of German work in Louisiana to the Louisiana Conference," which petition was granted. The German Conference continued in Texas until 1918 when the "work" was merged with the West Texas Conference with the exception of three charges and their pastors who were within the bounds of the Texas Conference. The German Conference lived a short life but an energetic one. Being led by educated, intelligent resourceful preachers, they established German newspapers, a German-American college at Friedericksburg, Texas, (the building was still in use a few years ago as the grammar school building of the city) a high school at Industry, Texas, a congregational school, Houston, Texas; these, and many other interests were discussed and advanced. Without question these German missionaries and German churches have left their mark in Methodism. The first year of the new regime is near its close...Notwithstanding opposition without and fears within, I was able to enlarge the District under my superintendence and to enhance its material and spiritual interests. The New Orleans District, German Mission Conference, is growing. On the 12th of September I dedicated a new church building on the St. Tammany Circuit near Covington, La. The house is forty-one by twenty-five feet, has a high steeple with a good bell in it, is neat and commodious and -has been paid for in full. In connection with the dedication service we held a German camp meeting which was largely attended and resulted in the conversion of nine souls and four accessions to the church. Many of our brethren exulted in the acquisition of a deeper wcirk of grace. Twenty-three of our brethren from New Orleans accompanied us and they all bless the Lord for His benefits. The new building has been named Boniface Church -linguistically and historically very interesting, especially to Germans. Boniface, you know, is called the apostle of the Germans. Brothers Vickers, Grote, and Wiemers rendered me valuable assistance during the meeting. Dr. McFerrin to whom the first letter was addressed was the publisher of the Nashville Christian Advocate. The second letter was addressed to the editor of the New Orleans Christian Advocate in which both letters were printed under date of October 7, 1875. J. B. A. Ahrens was the Presiding Elder, New Orleans District, German Mission Conference. And so Boniface Church was build and dedicated. We do not know who built it; more than likely the men of the community. We do not know its cost or how long it was under construction, but we do know that because of the love of God in the hearts of those early German people it became a reality. We also know that it was in use before being dedicated. F. Hempel wrote to "Der Kinderfreund"under date of August 2,1875, "I am happy that we have a new church." When Boniface Church was built, it obviously was erected on Government land! On October 25, 1875, Friedrich and Catherina Matthies sold to the Methodist Church South, two acres of land described as "on the South line of Patent Four Thousand three-hundred and thirty-six" and the Trustees were to "cause to be erected or built thereon, a house or place of worship" for the use of the members of the Methodist Episcopal Church, South. Trustees acting for the Church were C. Strattman, F. Matthies, J. B. A. Ahrens, J. Heiten, C. J. Wiemers, H.Voss, H. Dutsch, and Dirksen. However, no building was ever erected on this ground by the Church. In 1882 John J. Ryan, under the Homestead Act, acquired a large tract of land adjacent to the two acres sold by the Matthies. On August 29,1884, he sold 40 acres of it to the "M. E. Church, South, District German Mission Conference of Texas and Louisiana," with the following Trustees signing the Act of Purchase: C. Strattman, President, J. B. A; Ahrens, Treasurer, Fred. Matthies, Secretary, Board of Trustees, and H. Dirksen, C. Schultz, H. Dutsch and H. C. Voss, Trustees. 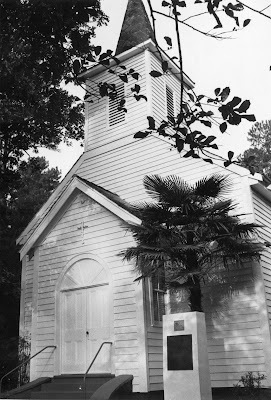 It is on a portion of this latter property that Boniface Church had been built earlier; the same church that through the years has been called St. Tammany Mission, Camp Ground, Talisheek, German Settlement, and now, Waldheim. John Ryan had filed for Homestead in June, 1875, which may have been about the time that Boniface Church was being built; but it will forever remain a mystery why the Trustees built a church on land that they didn't own. Although dedicated as Boniface Church, this name appears to have been little used. German Mission Conference appointments list it as either St. Tammany or St. Tammany Mission; and in the earliest local record available there is a "Treasurer's Account, St. Tammany Mission, German Mission Conference, M. E. Church, South, which lists certain receipts for the period March 16, 1877, through April, 1878, and disbursements during the same period including "articles for parsonage, $45.75." There is no record of when this parsonage was built; it was still standing, in a poor condition, in 1923. The young church was served in its early years by ministers appointed from the German Mission Conference: C. J. Wiemers who had been in "charge of the work" in 1875 was reappointed for 1876, followed by Christian Evers in 1877 and L. Saeger in 1878. The November, 1878 Conference listed no appointments; the entire New Orleans District delegation was absent due to yellow fever quarantine. During the year 1879, the Rev. 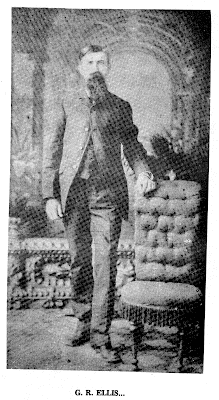 Isaac L. Peebles who was assigned to Covington, out of the Seashore District, Mississippi Conference, and who reported that he had eleven preaching places on his charge, apparently served the Boniface congregation. Jacob Merkel was appointed for 1880; for 1881 the charge was left to be supplied. The Rev. F. C. Matthies, local preacher, was appointed for the years 1882-83-84. Mr. Matthies appears to have been assisted at times by G. T. Vickers, 1881; J. J. Lovett, 1882; N. B. Young, 1883; W. B. Backus, 1884; all of these ministers were from the Woodville or Seashore Districts of the Mississippi Conference and, for the years given, had been assigned to Covington. Our Charge is not mentioned in any appointments for the years 1885-86 but it apparently was served by J. Wilson Brown, the minister at Covington. In 1886 the New Orleans District of the German Mission Conference was returned to the Louisiana Conference; but our church, which was being called "Tallysheek" at that time, was placed in the Seashore District of the Mississippi Conference, the boundaries of which extended to the north shore of Lake Pontchartrain in accordance with the Discipline of 1880. In 1887-88, the Rev. Matthies still served the Boniface Church. For the year 1887 John W. Tinnan was appointed to the Covington Circuit, but early in his assignment he asked for a transfer which was granted. He was replaced on the work by Gabriel R. Ellis who remained on that Circuit through 1888 when, "the work having been divided," he was appointed to the Talisheek Charge remaining here through 1890. The Rev. Ellis was a worker! In the St. Tammany Farmer dated April 9,1887, he inserted a notice to "Members and friends of the Methodist Church and all who are friendly to a Grand Camp Meeting in St. Tammany Parish" to meet at the German Settlement Church on April 20 to consider the matter, appoint a building committee, lay off the grounds, etc. Then, in the July 30, 1887, issue of the St. Tammany Farmer, this notice. "The first annual meeting for the St. Tammany Parish Camp Ground will commence on Thursday before the 4th Sunday in September (22). This Camp Ground is situated on the Little Bogue Falaya River, seven miles northeast of Covington and 4 miles north of Abita Springs, the present terminus of the P. & E. R. R. There will be a hack line between the Abita Springs and the Camp Ground for the transportation of all who may come by this route. There will be a public tent on the Camp Ground where all who desire to defray their own expenses can obtain board at very reasonable rates. All ministers of the gospel will be entertained free of charge, and are, with all others, cordially invited to attend. G. R. Ellis, P. C."
This notice appeared six times in subsequent issues. St. Tammany Farmer, October 1, 1887. According to the previous announcement, the Camp Meeting at the German Settlement opened Thursday, September 22. The meeting was a grand success, beyond expectation. The following named ministers were present: the Revs. T. S. West, P. E., Seashore District, Miss., Conf., J. N. Tucker and J. M. Gann of Poplarville, Miss., Mr. N. B. Young, Bible agent, J. B. A. Ahrens of New Orleans, and W. H. Foster. Messers. G. W. Walker and Elbert Miles of Stonewall, Miss., were present and rendered valuable aid in singing. The preaching of these humble ministers of the new covenant, from time to time during the meeting, was in demonstration of the Spirit and with power as could be seen at the conclusion of each service by the rush to the altar of poor penitents bathed in tears. The singing was lovely beyond description. Every evening, just as the sweet lullaby of the little song birds could be heard no longer and all nature seemed to be sleeping, crowds of ladies and gentlemen could be seen gathering under the Tabernacle, attracted by the voices of the sweet singers from Mississippi. From then until the time for the night service their melodious intonations in the songs of Zion reverberated through the rich forest that stands in magnificent beauty around our St. Tammany Camp Ground. While listening to these heavenly strains, I could not refrain from asking myself the question: "If music be so sweet on earth, what must it be in Heaven?" On Sunday, the Tabernacle, which has a seating capacity of 600, was full, and after the 11 o'clock service a collection was taken up to finish paying for the building and other incidental expenses. About $50.00 was collected, enough to meet all demands. So, Mr. Editor, in spite of all the powers of darkness, the croaking of some, the ridiculing of others, and the plea of poverty of some of our best citizens, the Tabernacle has been built and paid for, at a cost of $125.00, and the Camp Meeting has been held, resulting in the conversion of 25 or 30 souls and 11 accessions to the Church, the whole community wonderfully revived and God's name honored and glorified thereby. Now, Mr. Editor, let me return my heartfelt thanks to everyone who has in any manner or degree contributed to the building up of this encampment; and may they live long to enjoy the soul-stirring sermons preached, the pathetic prayers offered, and the enchanting songs that may from year to year be sung at our Camp Ground. Let me also add, "Bless the Lord oh my soul, and all that is within me, bless His Holy Name for what He hath done for us." G. R. Ellis. The Rev. Ellis' joy on this occasion was shared by others. An unidentified writer, (probably the Rev. J. B. A. Ahrens) in the German newspaper, "Der Famflienireund" stated, "The St. Tammany meeting proved to be a success. Between 700 and 800 persons participated. The new Tabernacle can seat approximately 500 persons. Sunday it was not only crammed, but many people could not obtain seats and had to stay on the outside on the green ground. The Tabernacle is a solid building and was built by the German brethren Dutsch and Schulz. It was erected near to our German Bonifacius Church. Ten preachers participated; they were guests of the home of the preacher...These meetings will be repeated every year. Saturday night and mainly Sunday, the altar was filled with penitents. Sunday night not less than 100 persons were at the altar crying to be saved by Christ.. .It was our honor to preach on Sunday morning. Preached on the words: "The Spirit does not diminish." Br. Matthies, supervising preacher of our German activities, was fully in his element and happy in the fire of the victory over the powers of darkness. Brother Ellis, preacher in Covington and Dr. West, presiding elder of the District, know how to take away the swag from the devil...Thanks to God for living Methodism." The hunger of these people for the Gospel message and the dedication and fortitude of the ministers who brought it to them is emphasized in these next accounts. St. Tammany Farmer, October 6, 1888. Notice: On account of the quarantine our St. Tammany Camp Meeting which was to last a week, continued but three days much to ws regret of everyone. On Monday night of the meeting, just when everything was ripe for a great revival, Dr. West announced that "On account of the appearance of yellow fever in different parts of the country the railroads were quarantined; and, fearing that he would have to walk a distance of 75 or 80 miles to get to his next appointment, he would be compelled to start several days beforehand in order to reach it on time." As there were but two other ministers present besides the writer, and they being worn out with much preaching, it was considered impractical to continue the meeting. The Lord was with us in saving power as the sequel will show; about 40 conversions, seventeen accessions to the church, a pledge of 11 persons to erect family altars...was, I think, a bright manifestation of the Spirit of God upon the heart...I thank God for Camp Meetings. I think Paul must have known something about them when he penned these lines. "And hath raised us up together and made us sit together in Heavenly places, in Christ Jesus." (Eph. 21:6). G. R. Ellis, P. C.
Christian Advocate, October 11, 1888. Meeting only 3 days instead of 8 as scheduled. Rev. T. S. West in charge -would have had to walk 75 miles to his next appointment as railroads were quarantined due to yellow fever outbreak. Forty conversions, 17 accessions to Church, 11 persons to erect family altars. Good attendance in spite of rain Sunday. G. R. Ellis. The Rev. West referred to was the Presiding Elder; the same question today is the District Superintendent! The P. E. of that time would walk 75 miles to keep an appointment! No wonder that the Methodist Church was strong! The Camp Meetings continued yearly until 1906. 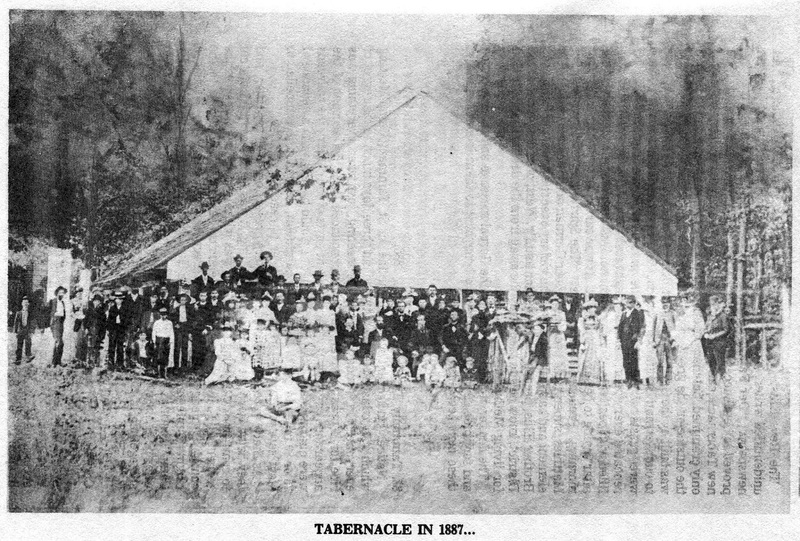 The old Tabernacle, however, continued to be used for protracted meetings or revivals until perhaps 1914; in September, 1912, a meeting was held at which it was decided "that we use boards (wooden shingles) to cover the Tabernacle and parsonage." It was also decided to pay no more than $3.50 a thousand for 36 inch boards and $3.00 a thousand for 30 inch boards. Although the repairs were probably made, the old Tabernacle which the author remembers to have still been standing in September, 1914, was demolished some time in the winter-spring of 1914-15. There are numerous accounts in the St. Tammany Farmer of the yearly meetings; in 1893 it continued for six days with 700 people in attendance on one day. "There were many persons present from Mississippi, New Orleans, and surrounding country. The choir, accompanied by 2 organs and a cornet, was the best ever heard at the Camp Grounds. The organs were played by Misses Mary Abney and Myra Parker and the cornet by Rev. W. H. Wallace." In 1894 it ran for 9 days, in 1895 for 8 days, in 1896 for 8 or 10 days (uncertain). Although offerings were received daily, in 1897, for reasons not stated, it was decided to enclose the grounds with a wire fence and charge a gate fee of 25 cents, good for the season, with children under 12 admitted free. We do not know how long this arrangement continued. This meeting continued for 8 days, "was well attended and a great success." This in spite of the fact that many areas and public transportation were quarantined because of yellow fever, Covington and Abita Springs being "the only places within 500 miles of New Orleans which were not under quarantine. About 1200 refugees were in Covington, 300 in Abita Springs, and several hundred more in the surrounding countryside. Every hotel and boarding house was full as were many private homes also. But no cases of contamination or infection." In 1898 it ran only three days due to stormy and extremely wet weather. In 1899 the Trustees thought it best "to defer the Camp Meeting this year." In 1900 we find "To comply with the wishes of the people to have a Camp Meeting this fall, the pastor in charge with the Board of Trustees decided to holdone provided we get $50.00 in cash by September 1 so we can get the Camp Ground in order and have security to pay the preachers' expenses. The collections were so small the last few years that the Trustees had to pay the deficit." As no further record of the meeting was found in either the Farmer or the Advocate, it is not known whether it was held. Perhaps the money could not be raised. In 1901 it opened on Wednesday, September 18, and on Sunday, the 22nd, "at least 1000 people were on the grounds." There is no indication of the length of the meeting. In 1902 it appears that a 4 day session was conducted. In 1903, it ran from September 3, through 13th with services morning, afternoon, evening and night! "Large crowds came from Covington and Abita. Perfect order on the grounds except one Sunday night when we had to call for help. Two brethren were sworn deputies to keep order and we suppressed the disturbances thereafter. The complaint had been that the disorder was from the country element, but we find that it is towns people who think they are 'smart, somebody' who come to have a good time at our expense...Bro. Ellis of Brooklyn, Miss., one of our old pastors, was with us over the last Sunday of the meeting; on Monday he lectured on his travels through Palestine. He baptised ten infants for me, using some water he had brought from the River Jordan." In 1905 the Camp Meeting closed on August 20; there is no record of when it opened. In 1906 it apparently ran only 3 days due to inclement weather and poor attendance. There is no record of meetings in the years 1907 through 1911. In 1912 we read "The Camp Meeting at the old Talisheek Camp Grounds, conducted by Revs. E. L. Whiddon and T. V. Peters, is drawing large crowds at the 8:00 o'clock services. There will be a service all day, Sunday, August 25, with dinner on the grounds." These appear to have been nightly "revival" services. 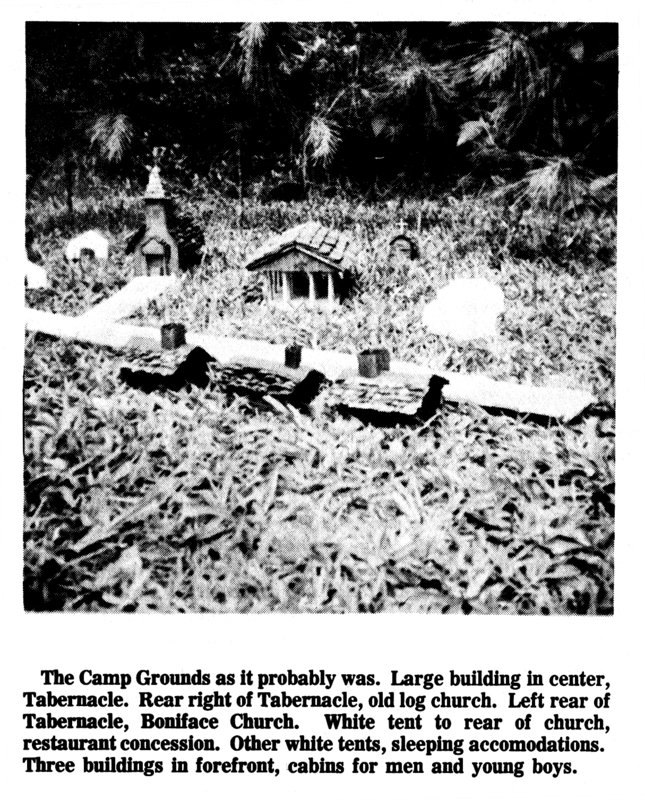 No further record of Camp Meetings in the Tabernacle could be found in either the St. Tammany Farmer or the New Orleans Christian Advocate. And so this wonderful evangelistic work, supported in infancy by the faith of its founder, the Rev. G. R. Ellis, and strengthened through the years by many God-fearing preachers and laymen, came to a close. Many of the preachers would preach for two hours or more, and services were often held three times a day, 9:00 a.m., 2:00 p.m., and 8:00 p.m.! People who attended services that often and sat so long, certainly loved the Lord and were starved for His Word. St. Tammany Farmer, May 7, 1887. Notice: Specifications of a shed or tabernacle for the German Settlement Camp Ground, to be let out to the lowest bidder at said Camp Groundson Saturday, May 14, 1887, at 10:00 o'clock, a.m. The shed to be 40 x 60 feet with 4 rows of posts lengthwise. Posts to be of the best lightwood, not under 6 inches at small end and to be put in the ground 3 feet. The posts to be 10 feet apart, making 28 posts in all. The two inner rows of posts are to be ten feet from the outer rows, and five feet higher than the outer posts, fastened by 20 penny spikes to the plates. Four plates, 60 feet long each, the plates to be of peeled pine poles or square timbers sufficiently large for the building. Rafters, 3 feet apart, to be of peeled poles faced on one side to straighten, or scantling 2x5. Some tabernacle to be covered with heart pine boards, 3 feet long, showing 11 inches to the weather; seven joists, extending from one inner plate to the other, well pinned. The shed to be 6% feet high at the eaves and gable ends weatherboarded. The rafters to extend one foot beyond the outer plates and the roof to extend one foot beyond the rafters. To be finished by August 15,1887. The building committee reserves the right to reject all bids. The nails and spikes for the building will be furnished, (unsigned) We find no record of the successful bidder. The Tabernacle had an earthen floor on which was scattered clean pine needles. Outside, there were several stands, 4 feet high and 4 feet square, covered with earth. At night, fires were lighted on top of these stands for illumination. One man was paid $5.00 for each meeting period to furnish pine wood and keep the fires burning. There is no record of the type of illumination used in the interior; probably kerosene lamps or lanterns. 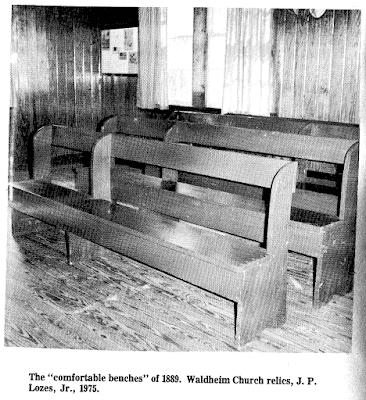 In all probability, worshipers had only plain pine board benches, backless, on which to sit during the two or more hours services, yet determined people let nothing deter them from attending worship services as witness this "Personal" from the St. Tammany Farmer of September 1, 1888. "Two old maids and three young maids desire to marry within the next two weeks in order to secure escorts to the Camp Ground Meeting. In regard to names, ages, etc., apply at this office!" Various persons erected semi-permanent camps on the grounds. Some people probably came in covered ox carts, in which they would sleep. There were three log cabins built on the east side of the old sand road in which the single men and boys slept. Rough bunks were built in them against the walls. One night, a few of the young fellows decided to liven things up a bit. They waited until those in the cabins were asleep, then quietly tied a rope to the bottom support of a tier of bunks with their occupants! As a boy, the author was told this much of the story, but not the finale! A restaurant concession was bid in each year for about $10.00, in which was served all that one could eat for 25 cents a meal. Preachers, local and visiting, were served free. Cold, fresh, drinking water was obtained from a clear spring which bubbled up over white sand in a stout barrel set firmly into the ground. This spring was located on the property of the Rev. F. Matthies, approximately 1000 feet from the Camp Grounds. It was reached by means of a narrow board walk from which people would lower a bucket on a rope into it. The initials of some of those who obtained water at the spring are still partly legible on one of the trees to which the board walk was attached for support. Water for washing clothes or for bathing was obtained from the cold, clear East Fork of the Little Bogue Falaya River which still flows about 300 feet west of the Camp Meeting site. Public transportation was provided by "stage" or "hack" from Abita Springs; one firm ran two trips from Covington daily, one at 8:00 a.m., another at 12 noon. Return trips from the Camp Grounds were at 11:00 a.m. and 4:00 p.m.; fare, $1.00 the round trip. Although dedicated as Boniface, it has been shown that through many years our church has been known by several names. German Settlement, because of the many German families in the community. Camp Grounds became obvious after 1887; the name may have been used even earlier as there is some evidence that there were "brush arbors" and camp meetings in 1875 and 1878. Tallysheek, because from 1883 until the end of 1907, the post office Talisheek was located near the church. On December 5,1907, the name of the post office was changed to Waldheim, the name and postmark becoming officially effective on January 1,1908. And so the name Waldheim, for our church, has gradually replaced all others. "There will be an entertainment at the German Settlement Methodist Church on Thursday evening, June 13, for the benefit of the Church, consisting of comedies, recitations, tableaux and music, followed by refreshments'for sale'. Admission 15 cents. Doors open at 7:00 o'clock. A pleasant evening is anticipated and there will doubtless be a large attendance." "We learn that about 200 persons attended the entertainment at German Settlement Church Thursday night..." The Farmer, June 22. "The entertainment at the German Settlement Church was such a success that it will be repeated by request about the middle of next month." The Farmer, June 22, 1889. F. Dutsch, F. Hempel. R. Davis, M. Edgar, E. Norman, J. Friebert, and S. Ellis. We also return thanks to all who contributed refreshments and those who presided over the tables. Recitation: Sugar's Courtship, by R. L. Davis; Comedy, The Widow's Victim; Tableaux, The Rock of Ages; Recitation, Gertrude, or True Fidelity till Death, by Miss E. Page; Comedy, The Assessor; Intermission. Tableaux, The Finding of Moses; Comedy, Too Much of a Good Thing; Tableaux, Pharoah's Musicians; Tableaux, 'The Flour of the Family' and The Bell of St. Tammany. F. Matthies." 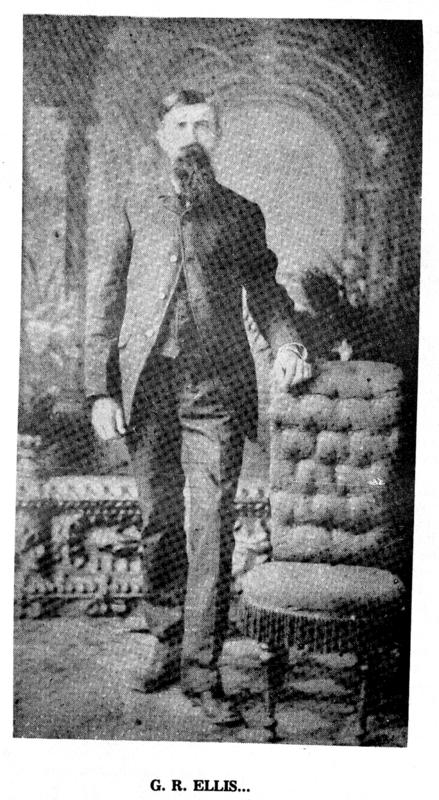 The Farmer, October 5, 1889. 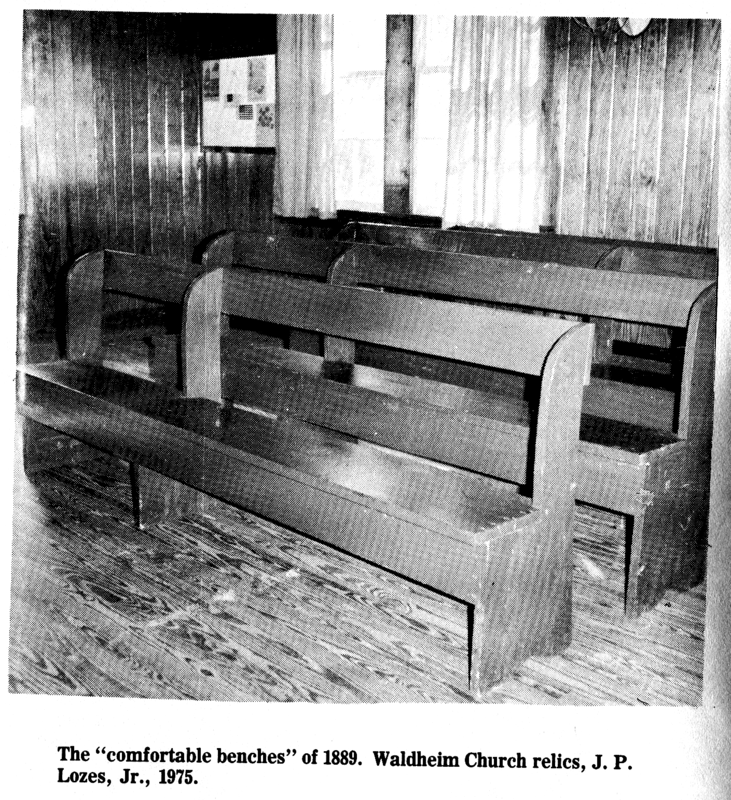 "The German M. E. Church at the German Settlement has been neatly painted and fitted up with a new pulpit and comfortable benches from the proceeds of the entertainment given several weeks ago and it is now one of the most attractive church buildings in the Parish." The Fanner, July 15, 1893. "On Saturday, July 8, an enjoyable reunion in the shape of a picnic was held at the St. Tammany Camp Grounds by members and friends...under the direction of Rev. D. C. Rawls... The services of the song in the Tabernacle attracted and held the attention of the visitor who came from Abita, New Orleans, and other points... This growing religious community has reason to be proud of their choir, and as soon as their new organ arrives it will be well worth the journey to the Camp Grounds to attend Divine service. This is the principal church in the Talisheek Circuit and under three months guidance of Rev. Rawls has improved beyond all expectations. The ladies of the congregation have raised sufficient funds to purchase an organ which will soon be placed in position. All of the material, lumber, etc., has been delivered at the grounds to complete and decorate the interior of the church, a new ceiling being one of the main features." From this item it is apparent that when dedicated, the church was not entirely completed. This raises some interesting speculation: as the height of the sanctuary from floor to ceiling is nearly 14 feet, with some 12 feet more from top of ceiling joists to roof peak, one can appreciate the sincerity of those early day worshipers. In summer, this open ceiling made for coolness, but in winter, with only one fairly large pot-bellied wood burning heater for comfort, the heat from which rose straight to the roof peak (if there was no ceiling as seems apparent), the worshipers must have been rigid with cold! But, they were a hardy people. They had to be! The original floor was made of wide pine boards which, as they dried through the years, shrank sideways, leaving wide cracks between them through which the wintry winds would blow freely. Many years later this flooring was removed and the present tongue and groove flooring installed. The old wood burner, however, continued in use for a long time; the marks of its legs are still visible, having been worn into the floor. The organ was of the reed type with a bellows which was inflated by the organist through constant pumping of two foot pedals. Two wooden arms folded out from under the keyboard; these enabled the organist to vary the volume of sound. This physical exertion was desirable in the winter as it kept the organist warm. But in the summer, pity the poor organist. Someone would have to stand near, constantly fanning her, and, at the night services with the windows open and a light on the organ to enable her to see the music, she dare not open her mouth to sing or speak. In fact, it was difficult to breathe because of the clouds of small insects that swarmed around her and the lamp! Verily, she had her reward in her service to her church. As the years passed, a wood shingled drop shed was built over the entrance door of the church. Still later this was replaced by a small vestibule and the old wooden steps with concrete. In about 1968, steel pipe was bent and installed as rails to assist the elderly in ascending the steps. Perhaps in the early 1930's a building was attached across the rear of the church forming a "T". The central portion of this building is a roomy choir area, on the south side is a small kitchen, on the north side of the choir is a small hallway off of which open two separate small rooms with sanitary facilities. Some time after 1939, when electric power first became available in this area, the entire church was wired and electric lights installed. In 1956 or 57 the Official Board sold some timber on church property, and with the proceeds built a large room or hall across the back of the choir-kitchen-lavatory building and attached to it. This building is known as Fellowship Hall and is used for Sunday School, Board and other meetings. To read the rest of the booklet, CLICK HERE for a PDF file containing the entire booklet about the church.